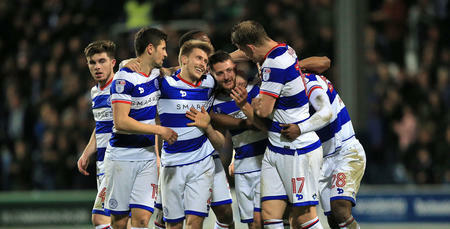 QPR returned to winning ways in the league with a hard-fought 1-0 victory at Wigan Athletic, courtesy of Nedum Onuoha’s second half goal. The R’s skipper powered home from inside the Wigan box in the 48th minute to secure all three points for Jimmy Floyd Hasselbaink’s typically hard-working side. Hasselbaink made seven changes from the side that overcame Rochdale in the EFL Cup on Tuesday evening, with Alex Smithies, Jordan Cousins, Yeni Ngbakoto, Karl Henry, Massimo Luongo, Tjaronn Chery and Sebastian Polter coming into the starting line-up. 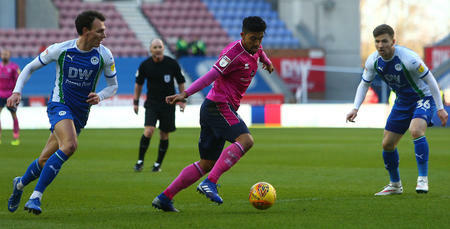 The R’s boss has been forced to use his squad as best he can during a hectic period of fixtures, with this afternoon’s game at the DW Stadium being QPR’s seventh in the space of 20 days. It meant Smithies lined up behind a back four of Jake Bidwell, Grant Hall, Nedum Onuoha and James Perch. Luongo joined Henry in the centre, with Cousins and Ngbakoto on the flanks. Chery played off Polter in attack. Defender Steven Caulker missed out with a minor groin strain. Wigan came into this fixture on the back of an agonising defeat at Nottingham Forest last weekend, conceding a 90th minute goal in a 4-3 loss. 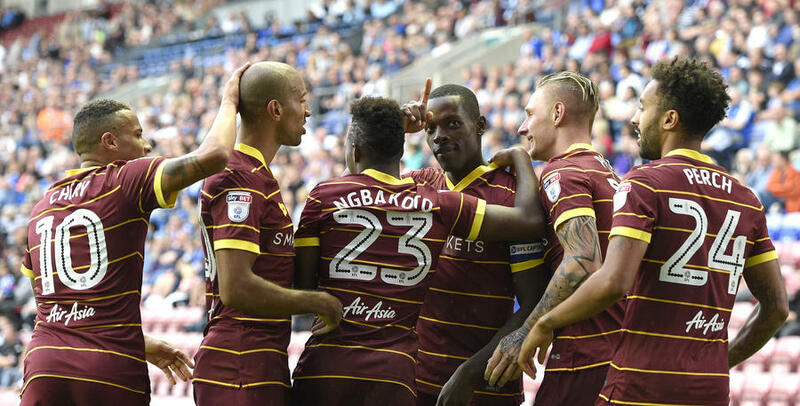 And while they have only managed one victory from their opening four league fixtures this term, it is worth noting that the four points they have registered have all been won on home soil – a 3-0 victory against Blackburn and a 1-1 draw with Birmingham. The hosts made two changes for the game, bringing in Jake Buxton and Nick Powell at the expense of Dan Burn and Yanic Wildschut. Following their success last season – the Latics were promoted from League One as champions – manager Gary Caldwell will surely view this campaign as one for consolidating in the second tier. QPR carved out the first opportunity of the afternoon, with Bidwell’s cross from the left being punched clear by Adam Bogdan, just as Hall looked to head goalwards. And on eight minutes, Ngbakoto warmed the palms of the Wigan stopper with a low drive from 25 yards. QPR were also architects of the next opportunity, with Chery firing over from distance after some good work in the centre of the park by Luongo. At the other end of the pitch, Onuoha pulled off a great sliding tackle to deny Michael Jacobs as he shaped to shoot in the R’s penalty box. On 37 minutes, a fine delivery from Ngbakoto on the left picked out Polter in the box, but the German’s header from 12 yards went just wide of Bogdan’s goal. Five minutes before the break, the hosts thought they had taken the lead with a far post header from Craig Morgan, but the goal was ruled out for offside. Right at the start of the second half, Powell cut through the R’s defence before firing a blistering shot just wide of Smithies’ upright, coming close to breaking the deadlock for the visitors. But the R’s went straight down the other end and did precisely that through Onuoha. Bidwell put in another excellent delivery from a free-kick on the right, and after Polter had brought the ball down in the box, it fell invitingly for the R’s skipper who slammed the ball into the back of the net from 12 yards. The goal was just what Rangers were looking for, but Wigan certainly had no intention of giving up the points lightly and on the hour mark Luke Garbutt forced a stunning save from Smithies, with the QPR stopper diving low to his right to push the ball to safety. At the other end, Ngbakoto saw his free-kick from 25 yards drift just over after Polter had been fouled just outside the box. Meanwhile, Garbutt hit the side-netting of Smithies’ goal with a set-piece of his own in the 70th minute. Latics substitute Yanic Wildschut skipped past a couple of QPR challenges in the 75th minute before centreing the ball, but Hall had read the danger brilliantly and was on hand to clear for the R’s. With just under ten minutes remaining, Hasselbaink made his first change of the afternoon, bringing on Ariel Borysiuk to make his league debut for the R’s, replacing Chery. Moments later, Polter had a great chance to double the R’s lead when he got in behind the Wigan defence but his first time shot was easily gathered by Bogdan. The Latics pushed hard in the closing stages to find the leveller, with Jordi Gomez forcing another good save from Smithies, diving to his right. Max Power also went close, but pulled his effort wide from 18 yards in the 87th minute. In injury time, Will Grigg headed over from close range, while Perch pulled off a stunning goal-line clearance to preserve the R’s cleanseet and ensure all three points went back to London. WATCH the best of the action from the DW Stadium.